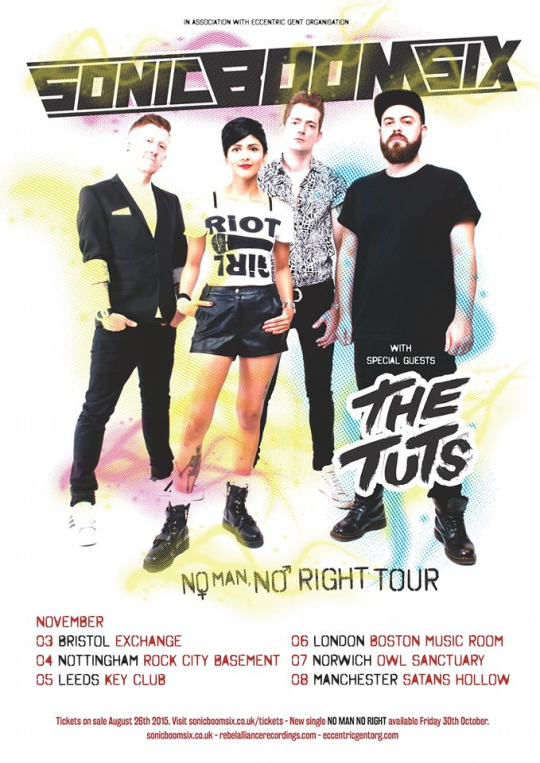 Sonic Boom Six have been a band for over ten years, yet 2015 has arguably been their best yet - or the year where it seems that they are at their most complete selves. It’s not just the crowdfunding campaign the band have implemented for their upcoming fifth album dubbed ‘The F Bomb’ (which frontwoman Laila says will be available early next year), which, at the time of this review, has reached a whopping 149% of their goal; but the songs actually featured on the record, a handful of which were played tonight. It gets boring when bands keep ranting about the same things, particularly in SB6′s case where socio-political issues dominate their lyrics - it can make people think that this is the only thing they’ve got to sing about. While anthems like ‘Virus’ and ‘Piggy in the Middle’ are some of the best songs the band have written, new songs like ‘L.O.V.E’ have a breath of fresh air to them - a sense of rejuvenation, empowerment and positivity that are noticeably absent from previous material. But, as we said in our review of their show at Camden Rocks earlier this year, their latest single ‘No Man, No Right’, IS the best song the band have ever put out, period. It’s a boneafied ska party anthem, featuring exceptionally smart and witty, but not cocky, feminist lyrics - and comes with a pretty hilarious fan featured video. It’s sad to think there hasn’t been a feminist tune this good since No Doubt’s ‘Just A Girl’ - and in this day and age it’s needed more than ever. ‘No Man, No Right’ is on par with Gwen Stefani’s jab at the mistreatment of women, and is even more of a reason to love the Manchester five piece.